U.S. Ecology Gained 34.9% in 2016. Is There Room to Run in 2017? The environmental services leader enjoyed a successful year despite industry headwinds. The year ahead has its own set of challenges. 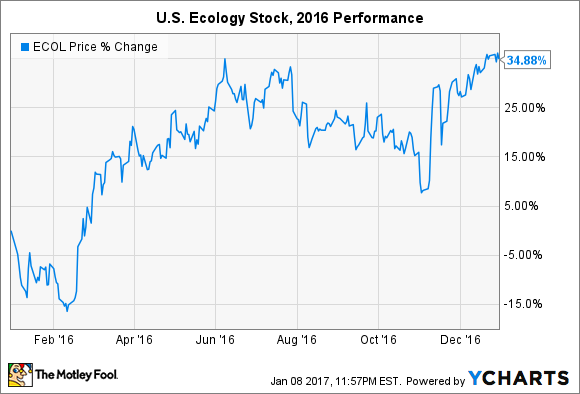 It was a wild and erratic year for U.S. Ecology (NASDAQ:ECOL) shareholders, but it's difficult to complain with 35% gains during 2016. Factor in industry headwinds and ho-hum growth, and the stock's performance is even more impressive. Then again, without a post-election bump from investors betting on increased industrial activity in the next several years, the stock's rise would have been much less exciting. What events and catalysts powered the stock higher? And, more important, what events should investors keep an eye on for the year ahead? There weren't any groundbreaking catalysts or events for the company in 2016. U.S. Ecology maintained its quarterly dividend payout of $0.18 per share -- as it has since July 2008. Revenue and profits from continuing operations barely budged during the first nine months of the year compared to the same period of 2015. Cash flow for the same comparable periods was nearly identical, around $56 million apiece. Investors really have to pore over the numbers to find one of the more noteworthy changes in financial metrics: a 6.8% improvement in shareholders' equity from the end of the third quarter 2015 to last September. You'd be forgiven for yawning. However, several easy-to-overlook business updates in 2016 could nurture future growth opportunities. U.S. Ecology acquired two individual facilities to bolster its capabilities and better serve customers in the key geographic regions of Los Angeles and Detroit. It also sold a nonhazardous waste facility located in Augusta, Georgia, to better align its portfolio with its core focus on environmental services. While individual facilities may not make major financial contributions, each complements existing facilities in the specific regions mentioned above. Leveraging a stronger network effect could be the difference between winning big contracts and not. Management also chose to reward shareholders for their patience and support of the massive acquisition of EQ in summer 2014 by allocating some of the company's strong free cash flow to a share buyback program. The program currently has $25 million available. That's enough to reduce the total outstanding share count by just over 2% at current prices, which are approaching all-time highs. In other words, the timing didn't really work out and the program is not likely to have much of an impact. I would have much rather seen management allocate that funding in other ways. A $25 million debt payment could reduce the company's long-term debt by over 9% and increase financial flexibility in the process. Another more favorable option would have been to increase the quarterly dividend. An annual raise of $25 million would result in quarterly payouts of $0.46 per share -- well above the current $0.18 per share -- and yield over 3.5%. Granted, the increase would need to last for more than one year to have any teeth, but if the company isn't worried about its strong free cash flow, then it shouldn't be a problem. Is there room to run in 2017? Investors will want to keep a close eye on 2017 financial guidance when U.S. Ecology announces full-year 2016 results in mid February. It will provide the first glimpse into management's current read on the industry and how the company's growth will fare in the year ahead. I would expect the company to follow suit with most others by not commenting on its post-election bump, but the financial outlook will hint at whether the sharp increase after Election Day was warranted. In all likelihood, the bump will turn into a bumpy ride for investors in 2017, since it's not really based on real-world market conditions. Consider that before Election Day -- weeks after the company's last press release -- U.S. Ecology stock was up just 8.5% for the year. That hints that the stock will give back some of its year-end gains. While it's certainly possible that improving operational performance and profitability could help the stock earn its higher valuation over time, the relatively sluggish growth in 2016 doesn't provide strong support that such an outcome will happen in a calendar year.